Hi everybody! Today I’m going to show you how to make dakgangjeong, a crispy and crunchy Korean fried chicken. Many of you probably know that I posted it once already, years ago, but the version I’m showing you today is a little easier than the last one, and will be faster to make: I don’t mix a batter, I just coat the chicken in potato starch powder. I also skipped the ginger slices so we can cook the sauce faster. In this recipe, both the peanuts and the chilis are optional. 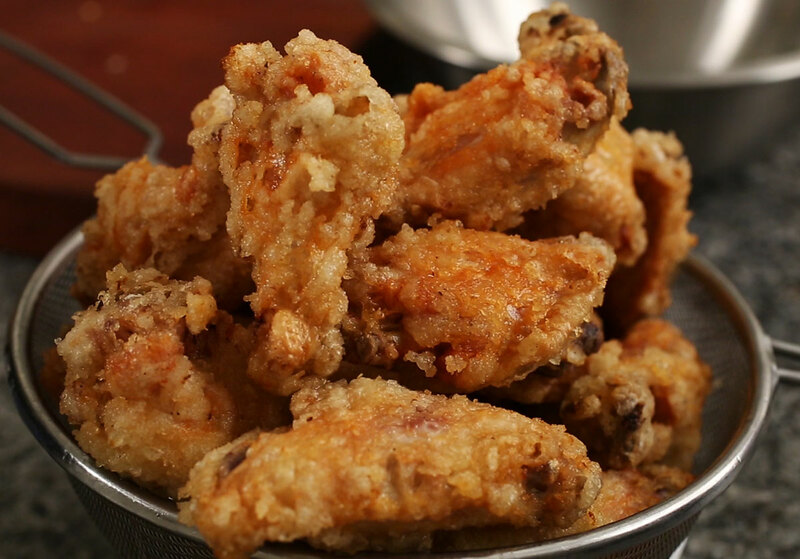 If you love fried chicken, I strongly advise you to try this recipe, my recipe for dakgangjeong with ginger slices (including a vegetarian version), and my yangnyeom-tongdak recipe which has been incredibly popular on YouTube! You’ll love all of them. And all Korean fried chicken should be enjoyed with pickled radishes! Mix chicken with seasonings and cover in starch. Fry in hot oil for 7 to 8 minutes. Shake off, let sit, then fry for another 12 to 15 minutes. Sprinkle sesame seeds over top and serve immediately. 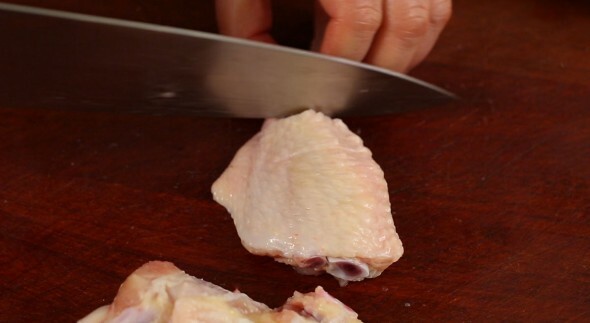 Cut off the tip of each wing and chop the wing in half. After this is done you should have about 3 pounds of chicken, with 24 to 26 pieces. Put the chicken in a bowl and mix with salt, ginger, and ground black pepper by hand. Put 2/3 cup potato starch in a bowl and dip each wing in the powder to coat it, one by one. 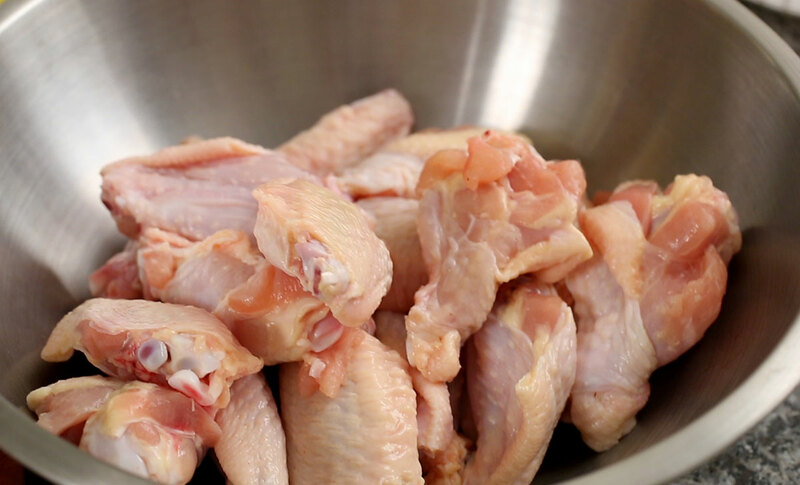 Squeeze each wing to press the coating to it tightly. Heat a large non-stick skillet or wok over medium high heat. Add 2 tablespoons cooking oil, minced garlic, and the dried red chili pepper. Stir with a wooden spoon until fragrant for about 30 seconds. Add soy sauce, rice syrup, vinegar, and mustard sauce (optional). Stir with a wooden spoon and let it bubble for a few minutes. Add the brown sugar and continue stirring. Remove from the heat. Set aside. 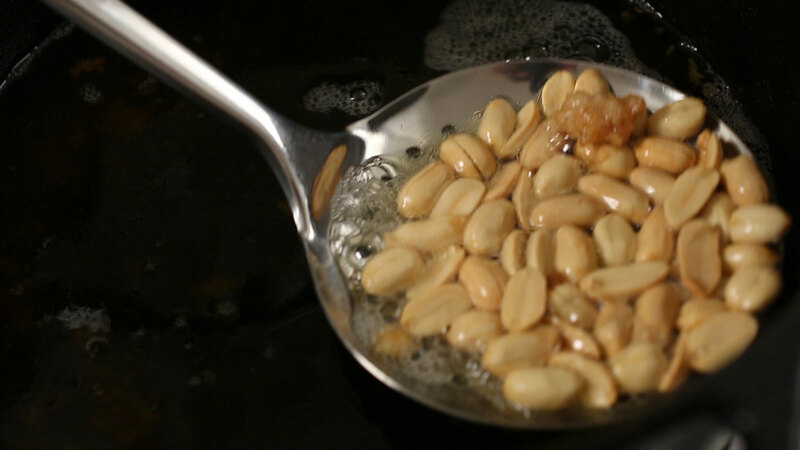 Put 4 cups of cooking oil in a frying pan or pot and heat it up for 7 to 8 minutes over high heat. See if the oil’s ready by dipping a test wing into it. If the oil bubbles, it’s hot enough to start frying. Slide the coated wings one by one into the hot oil and cook for about 12 to 13 minutes, turning over a few times with tongs. 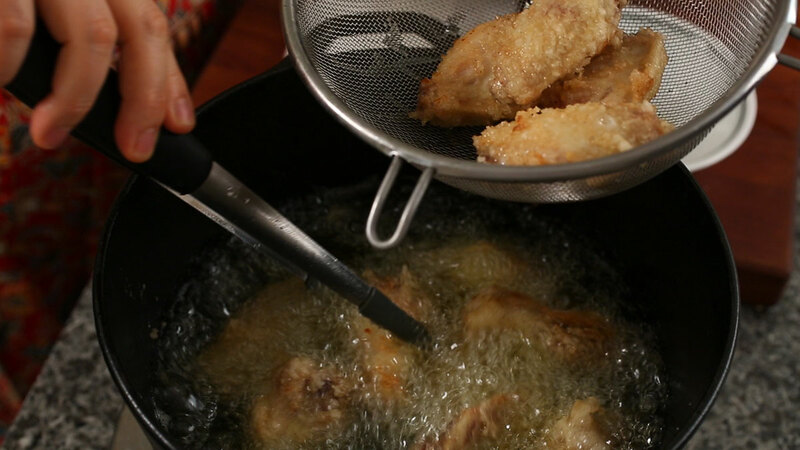 Take the wings out of the oil and shake them off in a strainer. Turn off the heat, and let the wings sit for a few minutes. 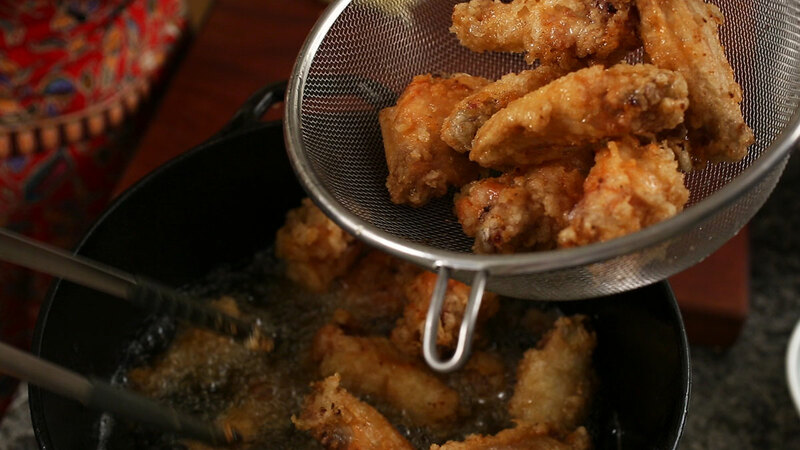 Reheat the oil and fry the wings again for another 12 to 15 minutes until they all look golden brown and feel super crunchy through the tongs. 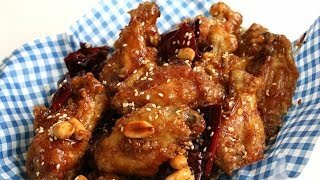 If your frying pan or pot is not large enough to fry all the chicken at once, divide it into batches like I do in the video. If you use a larger frying pot to cook them all at once, you’ll have to use more cooking oil. When the chicken is done, reheat the sauce until it bubbles. Add the hot chicken and mix well with a wooden spoon to coat. 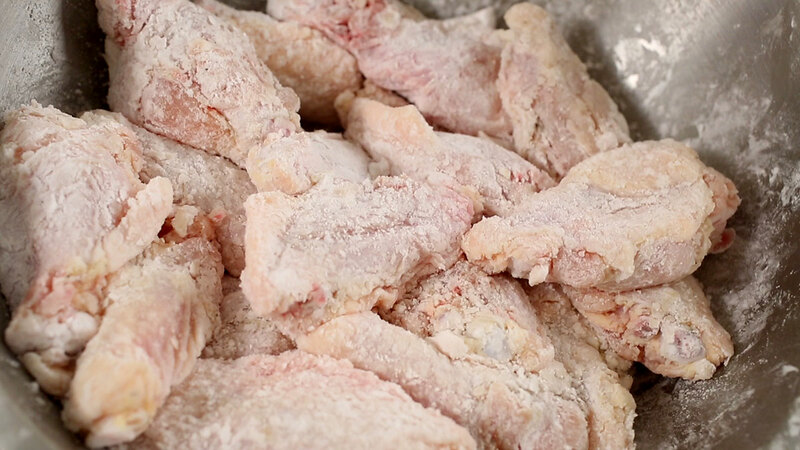 Remove from the heat and transfer the coated chicken to a large platter. 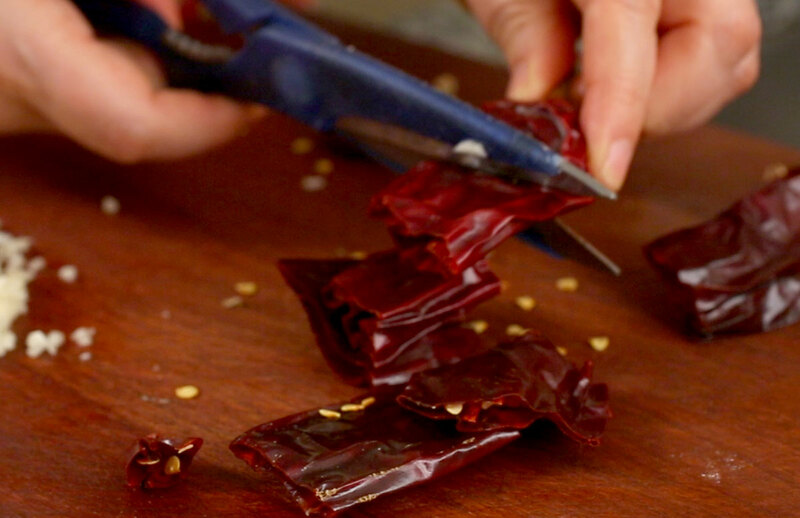 Sprinkle some sesame seeds over top and serve immediately. This chicken won’t lose its crunchiness, even by the next day. You don’t need any dipping sauce, but it goes well with Baek-kimchi. Posted on Sunday, January 26th, 2014 at 10:40 pm. Last updated on February 3, 2018. Posted February 28th, 2019 at 10:27 pm | Log in to reply. Posted February 28th, 2019 at 10:26 pm | Log in to reply. Posted February 14th, 2019 at 1:08 pm | Log in to reply. Made a big batch of this, and I’ve never fried anything like this before. I used honey instead of rice syrup, and it worked perfectly. The whole batch disappeared in 10 minutes, consumed by my husband & two teenaged sons. Fortunately, I did hid away some pieces for myself, because if I hadn’t, I wouldn’t have got any. Thank you for the receipt! Posted February 27th, 2019 at 9:00 am | Log in to reply. Posted January 16th, 2019 at 2:58 am | Log in to reply. I have a small resort in Cebu & would like to put this on our snack menu. However, the preparation time is a bit long. My question is: can I do the first frying, then vacuum pack when cool. Keep in the chiller. Then re-fry/ bake & finish at a later time? Or, pack away only with the batter on, do both frying in one go? Posted February 14th, 2019 at 1:20 am | Log in to reply. Posted February 27th, 2019 at 8:21 am | Log in to reply. That’s a great idea, I do the same thing sometimes! Posted January 2nd, 2019 at 7:43 pm | Log in to reply. Made this for the first time for my family tonight and it’s all gone. I used corn starch instead of potato starch. Also, i used my xl philips Air Frier instead of deep frying. 360F for 25 minutes. Shook the basket every 5 minutes. Then I cooked them at 390F for 15 min and shook basket every 5 minutes. I also used raw honey instead of rice syrup. I plan on using rice syrup next time. I ordered some online. Posted December 30th, 2018 at 9:31 am | Log in to reply. Posted December 28th, 2018 at 1:19 am | Log in to reply. Thank you for this recipe. My family loves it so much.. Looking forward to cook this again on New Year. Posted December 28th, 2018 at 5:29 pm | Log in to reply. Posted December 4th, 2018 at 7:32 am | Log in to reply. Just made this for my dad and I and we were both extremely pleasantly surprised on how good this tasted! Posted December 4th, 2018 at 10:15 am | Log in to reply. “… we were both extremely pleasantly surprised on how good this tasted” I’m so happy to hear that! Congratulations! Posted October 28th, 2018 at 11:49 pm | Log in to reply. Posted October 14th, 2018 at 5:42 pm | Log in to reply. Posted October 19th, 2018 at 12:29 pm | Log in to reply. Posted October 2nd, 2018 at 7:58 pm | Log in to reply. I’ve made this a few times now and I love it. I just made it tonight using honey instead of corn syrup and it worked great. Thanks again I love everything you cook! Posted August 1st, 2018 at 1:53 am | Log in to reply. Posted July 8th, 2018 at 4:08 pm | Log in to reply. Thank you so much for this recipe! I’ve been making it for over a year now and my fiance gets so excited every time, she says it’s the best chicken she’s ever had! Been following you for awhile and bought your book, I hope you’re doing great! Posted July 11th, 2018 at 9:00 am | Log in to reply. Wow what a nice compliment! I’m so happy to hear you and your fiance enjoy my recipe! Posted June 24th, 2018 at 2:03 am | Log in to reply. Posted June 28th, 2018 at 7:46 am | Log in to reply. Such a great table! I can imagine you are constantly making hearty and delicious food for your large family! Good luck with your cooking! 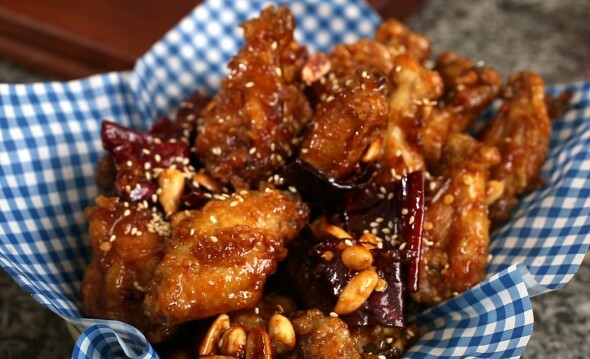 This recipe was originally posted on January 26, 2014 at 10:40 pm by Maangchi. It was last updated on February 3, 2018. The video was watched 10,322,375 times on YouTube & has 155,846 likes!